“America to Me” is a 10-part series on Starz that explores how race and class affect education in 21st century America. Filmmakers spent a year at Oak Park River Forest High School for an inside look at inequity in the United States – even in a suburb that prides itself on being liberal-minded. We speak with director Steve James (“Hoop Dreams”) of Chicago’s Kartemquin Films. Your own children graduated from Oak Park River Forest High School. Is that what sparked the idea for this film? We had three kids that went through the school system [in Oak Park] and went to the high school. One of them was a high flyer academically and the other two were not, and one of my sons was diagnosed with ADD really late and he had a difficult time at the school, had a case worker, and he struggled. That was one of the things that gave me this epiphany way back when they were in school there, that it would be interesting to look at the school because my own kids, who are white, had such different experiences and felt differently about the school. The community has been wringing its hands for decades over its ability to meaningfully impact the inequities, and I just remember thinking one time, “Wow, what would it be like for this one kid of ours if he were black in the situation? It would be compounded considerably.” So that was the original impetus, but then my next thought was, “There’s no way that I’d ever be able to do that story here because the community is way too protective of its image.” The school would not really want us to come in and investigate that, and I was right about that. I did an interview [at OPRF] about the Roger Ebert film [“Life Itself”] back in 2014. John Condne, one of the teachers there who teaches media there, saw the interview and I was asked, “What’s the story you’ve always wanted to tell and haven’t been able to do?” So I mentioned that this would be something that’d be interesting but I don’t see any way to do it, and he called me up and said, “Actually I think you can do it. It’s not really up to the school, it’s up to the school board.” And he said, “I think that the school board might be receptive to it,” and he turned out to be right about that. But administration did come out very publicly in opposition to the school board allowing us in, but the board overruled them and allowed us in anyway. There’s a portion of the film that looks at how members of the OPRF football team, who are mostly black, deal with racial taunting from opposing teams, who are mostly white -- specifically the Hinsdale Central team. I don’t know if you saw the article in the Oak Leaves the other day but it’s an article about how Hinsdale [Central] in the last two years has had a change in leadership and how they’ve clamped down on all of this, and Karen Sullivan the communications director for OPRF is quoted as being very supportive of Hinsdale, and honestly it reads like a press release. I emailed the writer as soon as I saw it and said, “I hope things have changed, but have you investigated with current athletes as to whether in fact that has happened?” And I think another important question that needs to be asked is: “Why has it taken so long?” This has been going on for years and years – and not just Hinsdale Central – but in other schools in this district, the West Suburban Conference, which is overwhelmingly white suburban schools, there has been racial taunting. This has gone on for a long time and suddenly now they’re addressing it, which is great if they’re really addressing it, but you know, why has it taken so long? And I do think the series has something to do with that. 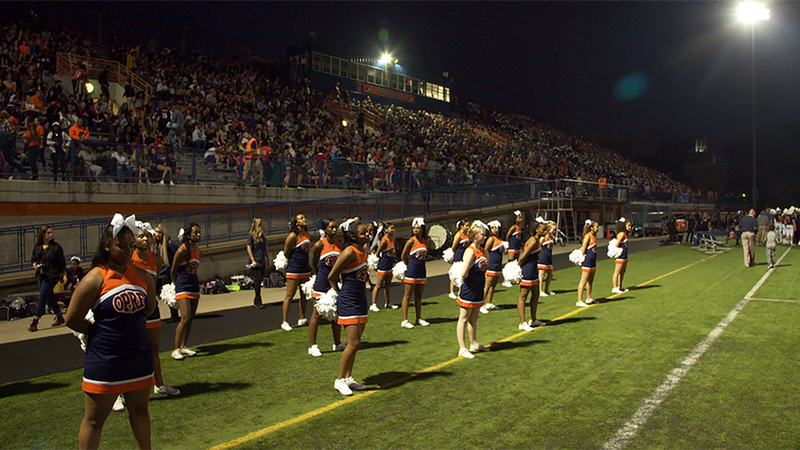 The administration at OPRF saw these scenes sometime last fall – we shared a cut of the film with them per our contract with the school board – so they knew this was coming. And again to the degree that the film has played some role in helping to spur change, I think that’s amazing and great but it also in my view doesn’t let everyone off the hook for investigating and asking hard questions about why it’s taken so long. How has the film been received in the community and the school? There are people who are definitely embracing this – teachers who are more activist who are engaging around the series and asking hard questions of the school and I know anecdotally from people who tell me that people are watching it and talking about it and debating it and all that it means. It’s definitely having an impact out here. One of the impacts that the series had before it ever even hit the air, the district superintendent, who was there during the school year [2015-2016] that we filmed, he very abruptly left and took another job. And I know, and someone in the series says this in that episode, and I think it’s absolutely true, that the series had something to do with his abrupt departure. You follow more black students than white students. Was that a conscious decision or is it just the way it worked out? In my original conception I was thinking only of following black and biracial students, or kids of color in general. Oak Park has a high percentage of biracial families so I didn’t want to ignore their experiences but I was definitely more focused on wanting to look at this issue through the prism of black students’ experience, and that was one of the primary motivators of doing the series to begin with, to look at their educational experience. But it became clear to me – and starting in Episode 5 we introduce two white families and their kids – it became clear to me, really from Challa Holland, the principal who left the school but was featured in the first two episodes, that we really needed to include white kids’ experience if we really want to understand the way equity works and doesn’t work in that school environment, and she was right about this. That did change the conception, but we don’t follow a representative demographic within the school, and one can weigh in as to whether that was the right decision or not the right decision. But I feel like the black kids that we follow in the series represent varying experiences of that school in interesting ways – they come from different class levels, in terms of freshman to senior, they come from different track levels, and they come from differing backgrounds. How did you gain the trust of the students? I think the series shows that trust happened, and I think it happened in part because I recruited a really great segment of directors [one of whom is Bing Liu, director of “Minding the Gap”] who are younger than me and diverse and made it easier for kids to relate to the filmmaker – didn’t have to work so hard to establish that relationship. But every subject, when you’re trying to tell a person’s personal story, there’s a period of earning trust. I also wanted to follow kids who weren’t big personalities, kids who were shy and more withdrawn because that’s a reality of teenage life for so many kids. I didn’t just want to pick the easy subjects.